Fur: Red-Brown with white fur on the chest and stomach. Personality: When he first came to town, he was shy around women due to his schooling and lack of sexual experience. This shyness caused him to stutter whenever he is around women. He was also shocked with the women of Bon Bon and their ideas of a good time. After working at the Delight Palace, however, he's grown accustomed to them and isn't as shy around them. He'll still feel shy if he is being flirted by others. But once he feels a great deal of arousal, he is filled with bravado. Leaf is more of a scholar than an athlete. This has made him unable to perform feats requiring large amounts of strength (IE Carrying a large barrel). Because of his comfortable upbringing, Leaf adopted the pacifist viewpoint and did not learn any means of fighting. He is also a bit of a klutz at times, leading to some awkward situations. Being kind-hearted, he is charitable and will be lenient for customers if they're a little short on paying for goods. In bed, he tends to be submissive, as he was raised on the motto of 'the needs of others coming before your own'. Occupation: Because of the time he spent working at the Delight Palace and his careful method of saving money, he now owns and runs a bookstore called "The Gilded Pen". Biography: This young man lived in New York City, New York. He was born in a family in which his father worked as a foreman for a textile factory and his mother stayed at home. Because of his father's job, Leaf was able to attend a boys only public school where he learned to read and write. After finishing school, he helped out his father in the factory through record keeping. However, the factory was shut down in 1894 due to the effects of the depression caused by the Great Panic of 1893. Leaf then tried to find work, but he kept coming up empty. One night, Leaf had been sitting on a bench, resting from a job search when he overheard someone discussing about Bon Bon. He heard about the individual's success in obtaining a fortune in the town. Gathering a few of his clothes and his money he saved from his job, Leaf left his hometown and headed for Bon Bon to try his luck. Clothing: Leaf wears a dark green vest with a white long sleeved shirt. He also wears a gray dress coat and pants and black shoes. He has a gray bowler on his head with a green ribbon on the hat and glasses with small rectangular-shaped lenses. He also carries a small black notebook with him to keep track of his personal expenses. This is a trait that rubbed off from his days working at his old job. Hobbies: One of Leaf's favorite hobbies is to read books. He doesn't care what genre the book is as long as he enjoys reading it. This is what inspired him to own his very own bookstore. Another for the bunny legion! Nice job, Leaf. I see you avoided the "armed and dangerous" motif and went realistic. You get my seal of approval. I think you have a great fursona. You've covered pretty much everything it seems. You might want to add his eye color, though it's not a big deal. Welcome leaf, would you like to come with me and hit the bars in town? I will eat every bunny out and let them scream in pleasure. Ooo... A bunny. Don't see many around here. Interesting. And a classic migrant and traveler, seeking greener pastures. Surprised I don't see that more often as it's delightfully open ended. Oh, and hello by the way. Think I missed your introduction elsewhere. Enjoy your stay here, Mr. Leaf. The rabbits are multiplying. Your name is quite the coincidence, as I'm watching an old series where one of the main characters is named Pete Thornton. In any case, welcome to Bon Bon. I was thinking of what made you choose your fursona, Leaf. It's a very interesting one, and I really like the different choices you've made for it. So why did you choose all those details like species, appearance, occupation and such? The occupation and appearance was actually inspired by, for lack of a better word, cliches. I wanted to make a character that didn't follow the stereotype of a Gary Stu. I chose a rabbit as a species because I happen to like them. It was tricky finding a species that would most likely exist in New York. That's when I found the Eastern Cottontail (the range of its habitat included where my character came from). That's one of the things I really like about your fursona. He's not perfect, and he's not some warrior carrying weapons around at all times. I think he'll fit in nicely in the comic. You don't really have to choose a species that lives in the area that your fursona was born in, as in the PBB world, people travel and move as they wish. So there are many fursonas where the species isn't native to the country the fursona is from. There are others where they do match very well, and it's a nice touch, I think. Besides, we have yet to see a male rabbit in the comic, I believe, so it's a good choice. 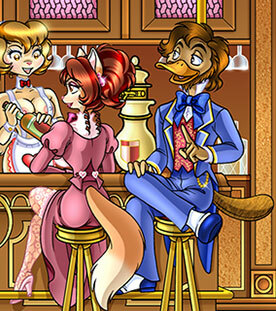 if i may interupt there but isnt xivk a male rabbit speices and i do belive he has been here longer so whodnt his fursona be the first male rabbit in the comic? Welcome Mr. Leaf. We surprisingly don't have many bunnies/rabbits/hares around here, even though its suppose to be one of the more popular species in the community. i pay attention or i wouldn't of mentioned u would i poor xivk *pats him on the head*. Hey now, I didn't say he was the first!